Picnic tables are very common things of every backyards and patio. These kinds of tables are attached or detached with benches for allowing multiple people to sit and eat together. Normally, most of the outdoor picnic tables are made of wood. 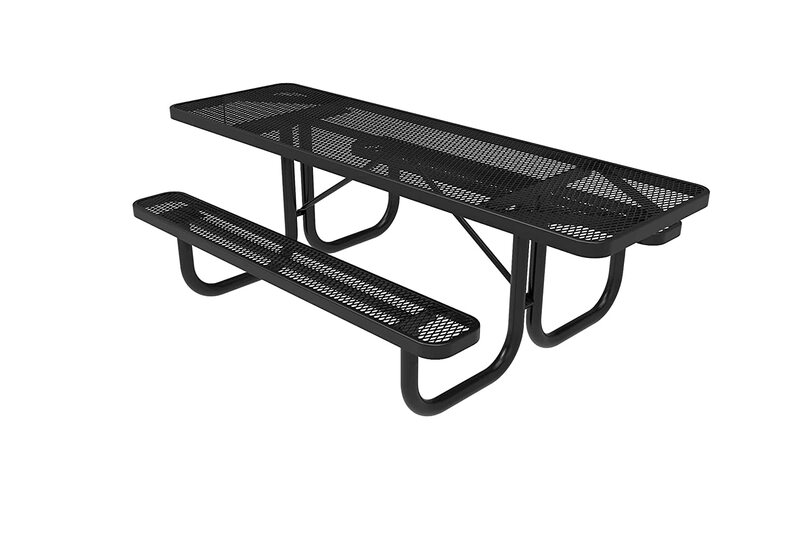 We also found some durable picnic table which is made of materials like polyethylene and metal. 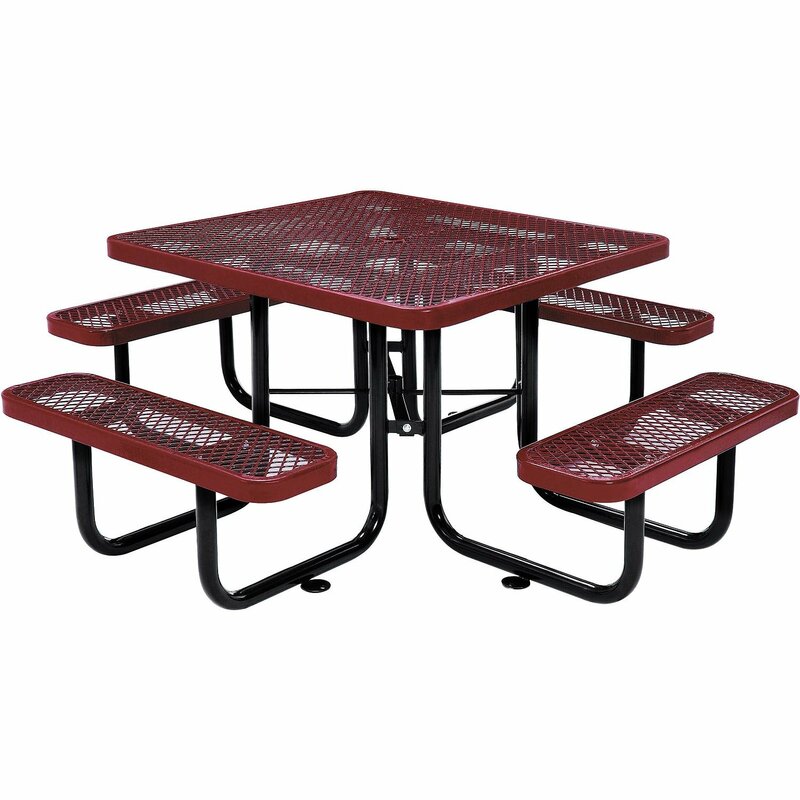 There are a variety of styles and shapes in patio picnic tables. Each of these picnic tables is unique and different from others. In this post, we have tried to provide some of the best outdoor picnic tables. All of them are great at their look and performance. So read the following items and get your perfect picnic table. This Metal Mesh Picnic Table is ideal for high-traffic seating areas like gardens, decks, parks, snack bars and many more. It is obviously stronger than other picnic tables which are made of polyethylene or plastic. This table is made by using heavy-gauge metal mesh with a red thermoplastic coating on the tabletop and benches. The protective coating creates a smooth and high-gloss surface that stays cool even in the hot sun. While the thermoplastic coating resists fading and mold which ensures maintenance-free durability through years of rough usage. It gives a comfortable seating facility in every season. There is a galvanized tubular steel frame under the tabletop and bench. This steel frame is shielded with a black powder coat finish for the rust-prevention and resilience against the elements. Also, the mounting tabs of this portable table allow anchoring to ground for extra stability and security. The table top features an umbrella hole of up to 1-1/2″ diameter. So that you can place your patio umbrella on the table surface. Additionally, the set screw is included to hold the umbrella pole in place. You don’t require an umbrella base because of this. For safety reasons, bench and table corners are well beveled. Easily 2 people can seat per bench. That means 8 people can comfortably seat in the whole set of these metal picnic tables. Perfectly made for a family picnic. Made of heavy-gauge metal mesh with a red thermoplastic coating. Comes with galvanized tubular steel frame. Thermoplastic coating resists fading, mold, and vandalism. You will definitely love this picnic table because of its beautiful design and material. This octagon shaped table is made from solid western red cedar. Each part of this table is handcrafted. Western red cedar is great to build outdoor furniture. It is especially well-known for resistance to rotting, beautiful color tones and its aroma fragrant. You can be left this set of furniture as provided to achieve a patina grey or you may seal it to retain its beautiful color. Most of the parts of this outdoor furniture are assembled and all the holes are pre-drilled. Also, the pieces are marked for a quick assembly. It will take about an hour to set up this octagon picnic table with the help of assembly instructions which is included. You will get the table top fully assembled with a sheet of cardboard under it. A drill is needed to insert the screws and then the furniture will be ready to use. This is an ideal seating set for eight people where everyone can see each other. There is a thick umbrella hole in the center of the octagon table top. In this hole, most of the patio umbrella pole will fit. All the edges of the furniture are rounded and surfaces are sanded for an extra smooth feel. Easy seating design, perfect seats for 8 people. Beautiful western red cedar with a wonderful aroma. Naturally resistant to decay and rot. Not easy to carry everywhere after full assembly. This portable table is perfect for any outdoor or indoor activities like picnic, parties, and barbeques to the park. It comes with a classic time-proven design and reinforced seat structure. This picnic table is constructed from solid aluminum alloy frame and high-density MDF board which gives superior durability and strength. In this spacious design outdoor furniture, up to 4 adult people can sit comfortably. The weight capacity of each bench is 220.5 pounds. You can easily wipe the table top surface if needed. The tabletop offers adjustable height option for conveniently varied positions. As a space-saving technique, the chairs can be efficiently folded under the table. This folding picnic table comes with a quick set-up feature and it required a very simple assembly. This compact picnic table and two benches can be converted quickly into one easy to carry unit! There is a 1.5-inch thick umbrella hole in the middle of the table surface to prevent harmful UV rays and provides extra protection on sunny days. Folds compactly for easy storage and transport. High-quality solid aluminum alloy frame. Heavy-duty, high impact seat structure. This beautiful picnic table will definitely attract your eyes. We hardly found a gorgeous picnic table like this. The traditional design highlights this picnic table with 2 separate benches. It can be a wonderful addition to any patio, park, lawn or garden. 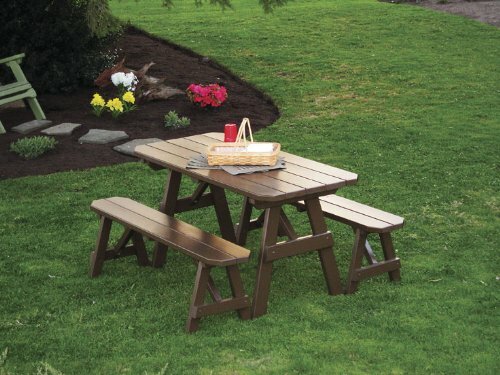 This picnic table set is finely crafted by the Pennsylvania Amish with natural pine wood construction. It will come in coffee paint and also available in a natural stain or unfinished if you want. The detached benches of this set allow for easy access. These 2 separate benches are perfect for seat up to 6 people (3 people per bench). With the fine Amish construction, surely this picnic table will last for years to come. This set of outdoor furniture is proudly made in the USA. Maximum 25 minutes required for fully assemble this item. The assembly is too easy. This picnic set will improve your outdoor experience and will help to enjoy your vacation. Comes with solid pine wood construction. Available in all custom made option. Tabletop does not have an umbrella hole. This picnic table is lightweight and convenient enough for home or outdoor use. It provides extra seating option for a backyard barbecue. 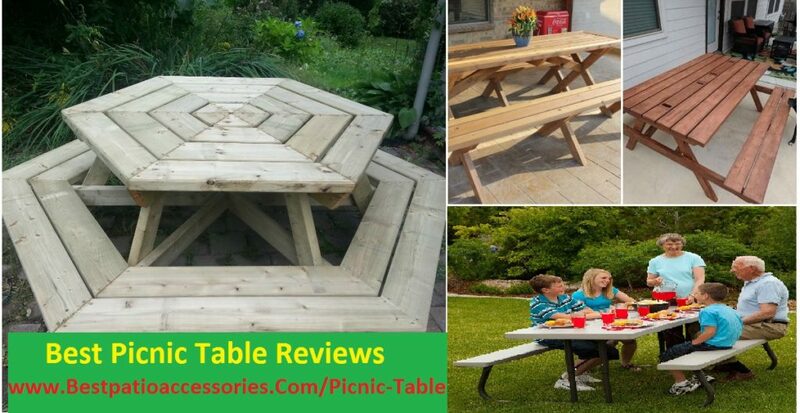 With this exceptionally sturdy and strong picnic table, you can give your kids an excellent outdoor craft area. The table top and benches of this set are molded of high-impact polyethylene. This high-tech plastic material is lighter, stronger and more durable than wood. While the structural frame features 100% steel which is protected with a powder-coat finish for excellent rust and weather resistance. This 6′ picnic table comes in the putty color finish. Its practical and family-friendly UV inhibitors protect construction completely resists stains and cleans easily. This outdoor furniture set won’t crack, chip or peel when exposed to the elements. 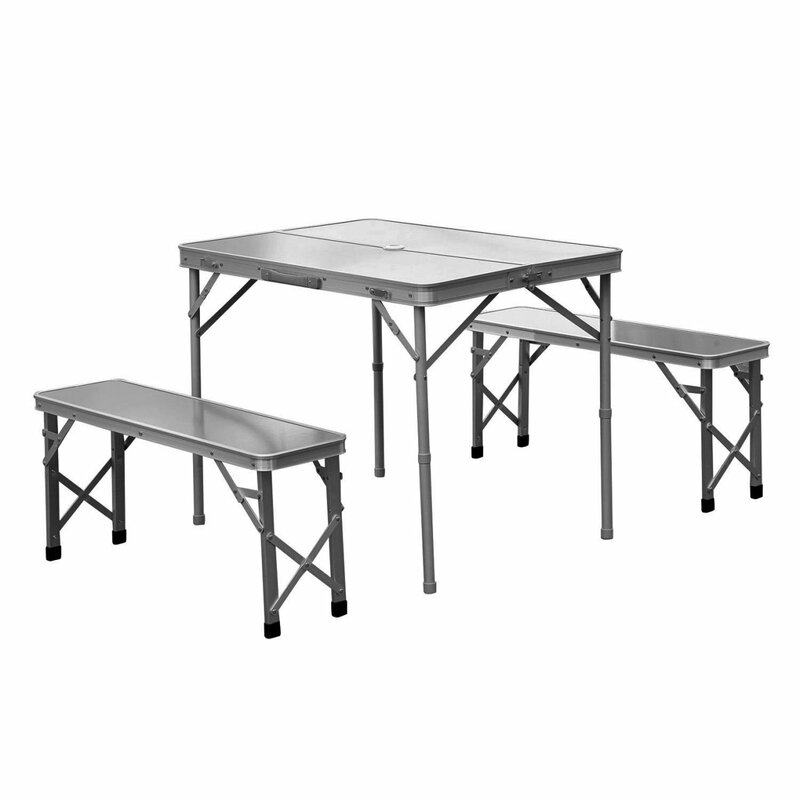 These picnic tables are very easy to maintain and it folds flat for compact storage, when not in use. You can keep the whole set of this picnic table at any corner of your home on offseason. It seats six to eight people for everyday dining or serves as a roomy buffet for festive occasions and parties. This folding lifetime picnic table exceeds BIFMA standards for commercial-grade furniture. A two-year warranty is provided with this picnic table which is great. You can easily adjust the table height as you want. We also found a 1.7″ diameter umbrella hole in the center of the table. It is large enough to place any standard size patio umbrella. All we can say that this folding picnic table can be a perfect choice for anyone. UV inhibitors protect against fading and cracking. Lighter, stronger and more durable than wood. The sturdy frame features a powder-coated, all-weather finish. Unassembled and has no instructions for assembly. If you need a substantial table for a docking site that is exposed to the sun and elements, then this great quality table is recommended. Its quality is really good. This 8 foot rectangular portable picnic table is perfect for outdoor gatherings. Up to 8 persons can be accommodated in this table set. The table top and the attached benches of this sturdy furniture set is made from high-quality polyethylene thermoplastic material. These black finish surfaces are stand with black frames. The structural frames are made of steel tubing which is completely galvanized inside and out. These plastic picnic tables looks very beautiful at any kind of patio, deck, lawn or garden. It comes in a flat box and not assembled condition. But it can be assembled very easily within an hour. You can get help from the assembly instruction which is included. This whole furniture set comes with a durable powder coat finish and two handicap accessible ends. You can take this portable picnic table quite easily for your family picnic or party. Expanded metal made of 2-3/8″ steel tubing. Totally galvanized both inside and out. Handicap accessible on both ends. Different colors and variations are available. Price is a little higher comparing others. 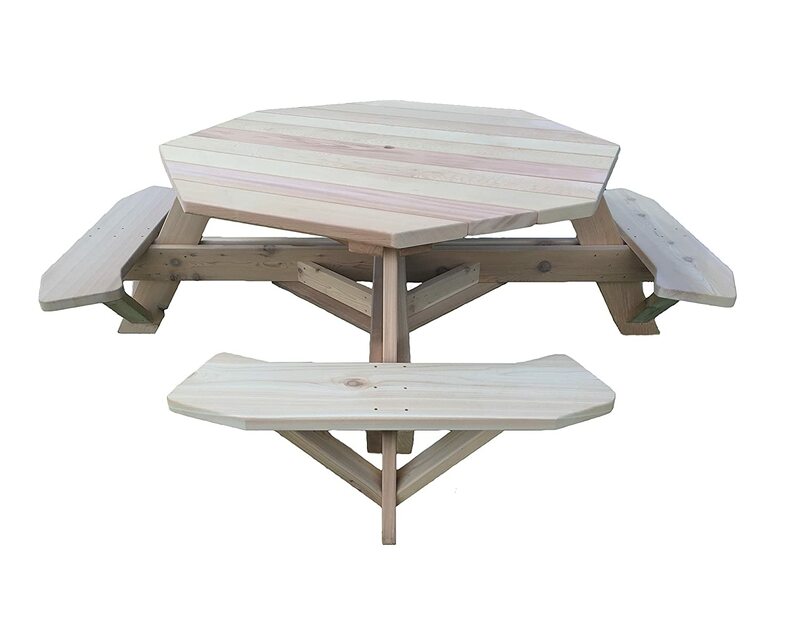 This picnic table set can comfortably seat up to 6 guests in any outdoor location like backyard, deck or garden. If you purchase this picnic table, it will be a great poolside seating and eating option. It can make your outdoor space feel a little more like home. This patio furniture set comes with an elegant rectangle table and 2 attractive long benches. 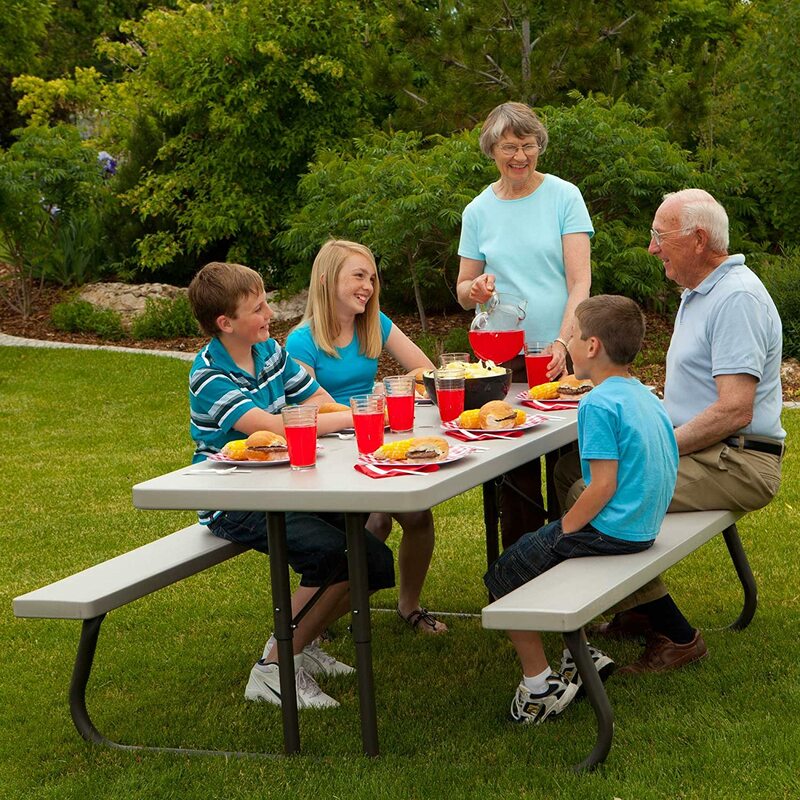 The comfortable benches fit perfectly on either side of the table for backyard family dining or parties. The sturdy build, durable make, classic and sand-blasted finish of this furniture can offer you years of sheer pleasure. 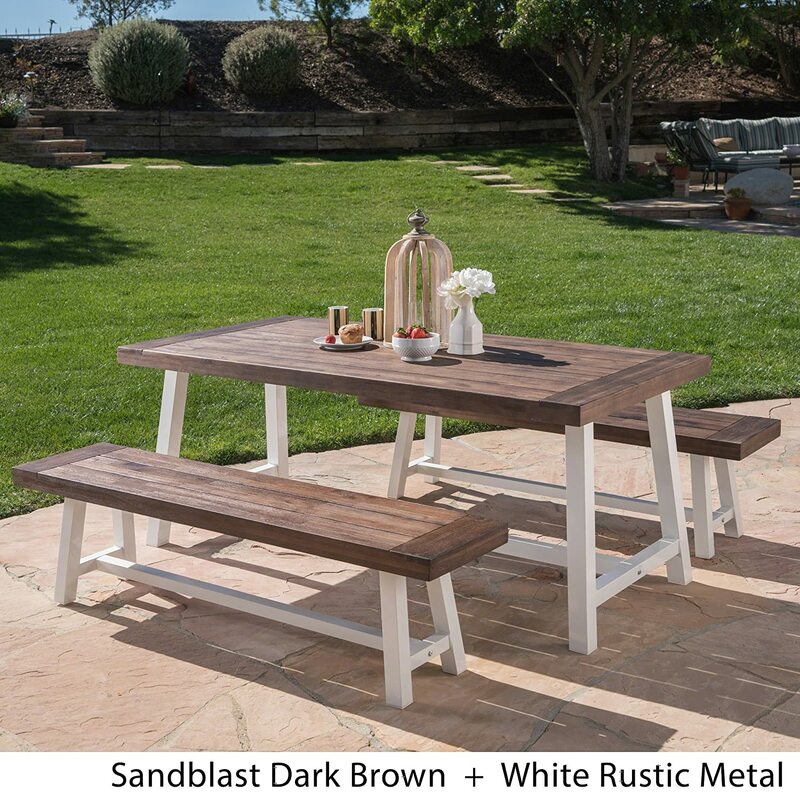 Because, this picnic table set is made from the beautiful brown acacia-wood top and the iron legs come with a white metal finish. These sturdy classic acacia-wood top and rustic iron folding frames are highly protected from weather elements. All the wood and iron components are rust resistant and water resistant. You don’t have to worry about the water damage caused by wet swimsuits and splashing. The all-weather quality makes this a great set for the pool. The vintage look of this cassie furniture set stays in good condition for years of entertaining. Its neutral and classic design looks great with other yard and patio decor. With this high-class furniture set, you can add style to your space without sacrificing comfort. The dimension of the table is 71.00” L x 35.50” W x 29.25” H and each of the benches is 63.00” L x 14.50” W x 17.50” H. So that, you will love how this outdoor furniture set uniquely fits your patio space. This patio dining set is perfect for years of outside use. It can be a great addition to any outside space like on a patio, in a sunroom, near a pool, BALCONY, outdoor bar, grill or BBQ pit & many more. It’s really easy to put together the whole set of these wooden picnic tables. Made of sturdy, durable wood and iron components. Totally rust resistant and water resistant. Looks great with other yard and patio décor. Perfect for years of outside use. Not so lightweight to carry everywhere. At first, you have to consider the material of the table. What kind of material has been used to make the picnic table? Is it constructed from metal, polyethylene or is it made in a more classic way from wood? Usually, these materials are used to create a picnic table. Guest seating capacity is one of the most important factors. You should figure out how many guests you want to invite for the picnic or outdoor party. It will help you to choose whether you need a small, medium, large or even multiple tables to accommodate your backyard. You have to know the exact dimensions of your new patio furniture. It is very essential to ensure that you get a table and bench set that fits your needs and your space. Oversize furniture can create multiple problems. That’s why you have to consider your outdoor space area before you order any patio furniture. There are a variety of different styles and shapes of picnic tables are available as we have discussed earlier. You can purchase any of these items for your satisfaction. All we can say that your demands and requirements are always depends on you.